Call Trucks Only Internet Department 602-354-7623 for all the specs and to schedule your test drive! Taking the road less traveled has never been more fun than with this 4WD. 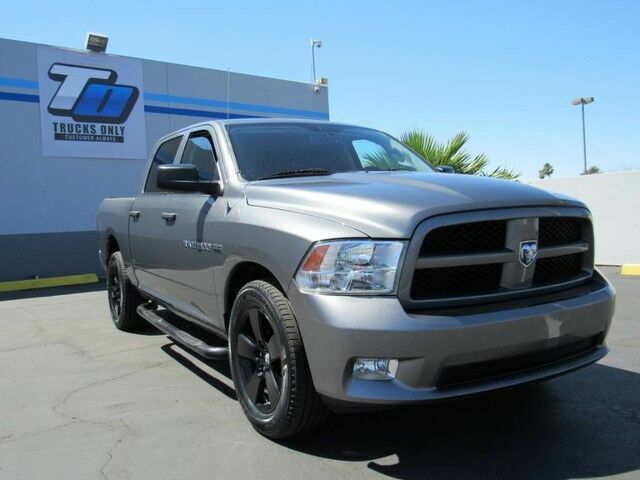 With improved performance, mileage and acceleration, this 2012 4WD Ram 1500 Express is king of the off-road. Beautiful color combination with Bright Silver Metallic exterior over Dark Slate/Medium Graystone interior making this the one to own! This is the one. Just what you've been looking for. The look is unmistakably Ram, the smooth contours and cutting-edge technology of this Ram 1500 Express will definitely turn heads. First Oil Change on us, with every vehicle purchase. Ask if this vehicle qualifies for our Lifetime Engine Warranty! *Diesel and high performance engines are not applicable. Trucks Only has been in business for over 40 years. Our customers have helped us to earn and maintain the A+ rating with the Better Business Bureau and we have been honored to achieve the Customer Satisfaction Award with DealerRater 3 years in a row! Call Trucks Only Internet Department 602-354-7623 for all the specs and to schedule your test drive! Shipping is available across the United States! Please let us know how we can help you find the right solution for your needs!